Many low-income developing countries have joined the group of Eurobond issuers across the globe— in sub-Saharan Africa (for example, Senegal, Zambia, and Ghana), Asia (for example, Mongolia) and elsewhere, raising over US$21 billion cumulatively over the past decade. Tapping these markets provides a new source of funds, but also exposes borrowers to shifts in investor sentiment and rising global interest rates. We examined the experience of low-income developing countries with capital inflows in the last decade and a half in a recent report . We found that capital inflows have increased sharply since 2004, in two distinct waves: a first surge from 2.1 percent of GDP in 2004 to 6.9 percent in 2007, and, after a temporary dip during the global financial crisis, a strong rebound, reaching 6.3 percent of GDP in 2012 (Chart 1). The steady increase in private capital inflows in the 2000s—together with improved growth prospects and domestic economic conditions—highlights a key shift in the financing from official sources to international capital markets for this group of countries. Private capital flows in 2012 were larger than either aid or remittance inflows, which amounted to 3.5 and 5.2 percent of GDP respectively. 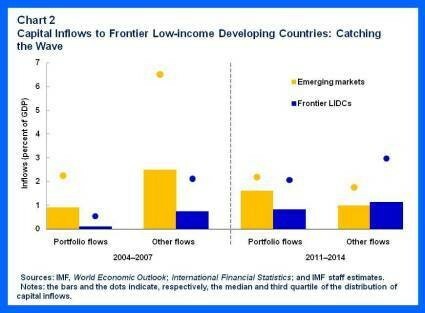 The composition of inflows has also been changing over time: while inflows consisted primarily of foreign direct investment in the early 2000s, the post-global crisis period has seen an acceleration in portfolio debt and equity inflows, as well as other inflows to the non-official sector, such as cross-border bank lending. A handful of countries have driven the uptick in these inflows. These represent the fast-growing frontier economies that have, in the main, opened their capital account at a faster pace than other low-income countries. Many are now as open as emerging markets, and receive inflows comparable to the levels attracted by emerging markets (Chart 2). -Sovereign bonds issued by low-income countries amounted to US$4 billion in 2013 and to US$8 billion in 2014, thanks in part to issuances by Côte d’Ivoire, Ethiopia, Ghana, Kenya, Senegal, Vietnam, and Zambia. In 2015, with weaker global conditions and falling commodity prices, the number of issuances declined and those who issued new bonds had to pay significantly higher yields. -A sizeable increase in cross-border bank syndicated loans boosted the rise in other inflows, particularly after the crisis. These loans amounted to more than US$73 billion over the period 2000–2014, and for some countries, were large in relation to the size of GDP. Capital inflows are an important source of external funding for developing countries that can stimulate investment and promote financial deepening in many countries. 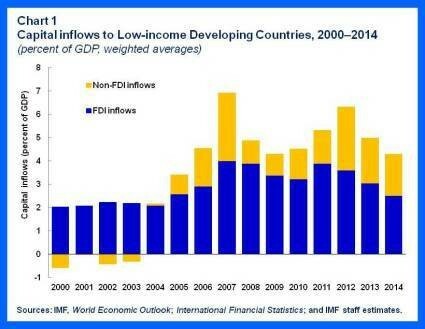 And, as our report documents, the recent increase in capital inflows (other than foreign direct investment) to many low-income countries has been associated with a rise in public investment. However, higher capital inflows have also funded higher public consumption. Specifically, in several other countries that recently issued sovereign bonds, including Ghana, Mongolia, Vietnam, and Zambia—on average—portfolio debt issuances have coincided not only with increases in public investment but also public consumption. In this context, one cautionary note is that if countries do not use inflows productively to increase economic potential, they will face a significant future debt service burden that will weigh on income levels. Moreover, we have to keep in mind that increased financial integration makes countries more exposed to shocks from outside their borders, as discussed in a previous post . Capital inflows can be volatile and susceptible to changes in global conditions—such as swings in commodity prices and exchange rates. There are currently three main external risks to the scale of capital inflows: the gradual increase in global interest rates, the retreat in commodity prices, and the rebalancing of the Chinese economy. And, both the levels and costs (for example bond spreads ) of capital flows are responsive to global economic and financial conditions. 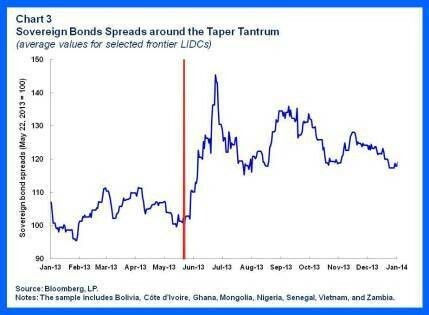 The market turbulence that followed the announcement made by the Federal Reserve in May 2013 about the possibility of tapering its bond purchases sooner than previously expected reverberated not only on exchange rates and bond prices in emerging markets , but also on sovereign bond spreads in frontier economies (Chart 3). However, domestic economic factors matter as well—for example, as our analysis shows that the price of new external funding tends to rise with higher current account and fiscal deficits, higher public debt, and lower foreign reserves. 1. First, domestic economic policies do matter. The level and terms at which countries receive external financing responds to both external and domestic economic conditions. This includes solid fiscal and external balances, sustainable debt levels and strong foreign reserves. 2. As a corollary however, this also means that countries where domestic economic policy management has been weak or is slipping are likely to experience a sharp retrenchment in terms of access and/or pricing of external financing. This may require significant changes to fiscal policies and investment plans. 3. Last but not least, countries need to recognize the double-edged nature of capital inflows when considering the pace and sequencing of their efforts to liberalize their capital accounts. Also, countries need to make effective use of the external private financing to increase economic potential through productive investment, while building economic resilience to handle additional financial volatility and associated risks. This underscores the importance of maintaining strong economic policies and building public debt management capacity.